Boston, in this day and age, is synonymous with sports success. Teams from the city won 10 championships since 2000, with the Boston Red Sox winning three, the New England Patriots winning a stunning five, and the Boston Celtics and Boston Bruins winning one apiece. In addition to the 10 titles, the four major teams have garnered an additional five big game appearances in the new millennium. After the doldrums of the 1990s, Boston fans have shaken off the ‘lovable losers’ label and have risen to the pinnacle of sports success. One of the things that players and coaches alike always say about the city is the importance of the fans. Boston fans are some of the best in the country, if not the best period. But who are the most fanatic fans overall? The Red Sox get a bad rap a lot of the time because the winter sports are usually fully into their playoff runs by the time the Sox get going, so they don’t get a lot of attention early in the year. Red Sox fans are quick to turn on their team, as evidenced by the fact the 2018 team is receiving many harsh criticisms and being laughed off despite having one of the two best records in baseball, only because the New York Yankees are matching them step-for-step—which they are supposed to do. Red Sox fans often have a love-hate relationship with their team, so their cockiness isn’t always high like some of the other teams. There is no end to Patriots’ fans arrogance. They deserve to have some of that arrogance, mostly because they have the best quarterback and coach in the history of the NFL on their side, but it can be very tiresome. The Patriots made it to at least the AFC Championship Game since 2011, so fans have a right to their pride. But since the 2014 championship season, the fans’ egos have grown so large that it is only fueling other fans’ hatred of the NFL’s equivalent of an evil empire. The Celtics haven’t quite reached the zenith of their abilities like the Patriots, so the fans haven’t spiraled into complete lunacy as of yet. But the reputations of both Danny Ainge and Brad Stevens caused Green Teamers everywhere to puff up their chests just a little bit higher. Not having a title since 2008 takes a little bit of the unbearable edge off, but it is still there nonetheless. The Celtics’ new underdog mentality and come from behind attitude also makes the fans arrogantly confident that they will always win whatever game they’re in, which is partly why the recent Game 7 loss to LeBron James and the Cleveland Cavaliers hit so hard. The Bruins haven’t had much to be confident about in recent years up until 2017-18 as they missed the playoffs barely in two of the last three years prior to this last season. Even midway through the year, when the Bruins were setting franchise records and winning constantly while climbing in the standings, Bruins fans were apprehensive about their success, believing eventually they would regress to the mean. If this was just five years ago, they might receive a higher grade, but up until this year this team had nothing to be confident about unlike the other three teams. The infuriating thing about Red Sox fans is how fast they jump off the wagon right when things get a little tough. Baseball seasons are long and arduous, and bumps in the road are to be expected. But Sox fans overreact so much about the smallest things, and it’s incredibly frustrating. This year, the fans’ ire is directed at Chris Sale, for ‘not being good.’ It’s true that his numbers are down, but he was a Cy Young Finalist last year, and even though his numbers aren’t what they were during his monster year last year, they are still very good. This is a recurring trend with the Sox, and several athletes have left after not being able to take the pressure. The only reason the Sox get as high a grade as they got is that their fans have undying support of the Sox. 86 years of faith speaks for itself, and they have been justly rewarded these past few years. The Patriots’ mantra has been endlessly repeated, especially in the past couple of years. In Bill we trust. Do your job. Bill could make a bad trade, like trading Chandler Jones or Jamie Collins, but the Patriots fans will always coalesce around their coach and defend him even if the move is obviously the wrong one. Bill Belichick and Tom Brady can do no wrong, essentially rising to almost deity status in the sports world. However, with the offseason drama this year, those feelings may be starting to wane with bridges reportedly starting to burn down in Foxborough. Green Teamers are even more infuriatingly loyal than the Patriots’ mafia. Ainge refused to pull the trigger on several different trades in past years, unwilling to part with marginal talents like Avery Bradley and Jae Crowder to secure players like Paul George and Jimmy Butler. The Celtics have drafted so well over the past four years that it has clouded the fans’ minds. This is the same general manager who drafted busts like Fab Melo, Marshon Brooks, J.R. Giddens and more in the first round. “Trader Danny” earned his reputation, but the Green Teamers take it way too far. The entire reputation of Ainge is basically built on three trades—acquiring both Kevin Garnett and Ray Allen, and trading Garnett, Paul Pierce and Jason Terry to the Brooklyn Nets. Celtics’ fans have the least objectivity among the teams. The Bruins have an incredibly loyal fan base, it just happens to be the smallest of the four major teams. The TD Garden is routinely sold out, but—fortunately—the Bruins’ fans don’t have the obliviousness of their football and basketball counterparts. The Bruins’ fan base may be on the rise after the rise of young guns like Jake DeBrusk, David Pastrnak, and Charlie McAvoy so the bright future will translate to a larger base for the Black and Gold. This grade is primarily based on the sport itself. Baseball, especially in the regular season, isn’t the most exciting sport. There isn’t constant action. However, the Red Sox do travel very well, with a widespread fanbase. They have a large following in Florida and also represent well on the West Coast. The fear that grips teams in Gillette Stadium definitely isn’t because of the fans. The fans in Gillette are marginal at best, not nearly as raucous as places like Dallas, Pittsburgh or Green Bay, and they aren’t even close to madhouses like Buffalo or Seattle. The fans are obviously intense when it comes to the defense of their team outside of the game and online, but during the game, especially compared to the other NFL teams and the other Boston teams, the atmosphere is decidedly lackluster. There is no greater evidence of the importance of the Celtics fans’ intensity than the fact that they went 11-1 at home in the playoffs this past year while going 1-7 on the road. The Celtics feed off the sea of green in the TD Garden on a nightly basis, and the crowd is always ready and waiting to explode in cheering for the Celtics. Teams that enter the Garden often remark about the fans, and James made special reference to the Garden Faithful after Game 4 of the 2018 Eastern Conference Finals. The Garden houses the two best crowds in Boston. The Bruins bring their own type of ferocity in their crowd, and the honorary captain who sits in the stands prior to the game start is often ingrained in Boston sports history themselves, so the crowd just gets even more amped. This past year, Tommy Heinsohn and Tedy Bruschi led the fans before some of the playoff games, and there was no greater show of patriotism than the Garden fans singing the national anthem along with Rene Rancourt following the Boston Marathon bombings in 2013. The Red Sox fans often remind me of a whining child. They always want that shiny new toy on the free agent market, thinking that spending more and more will solve all the Sox’s problems. They are definitely objective in finding fault in their team, but it might be slightly pessimistic at times. In Bill we trust. In Bill we trust. In Bill we trust. In Bill we trust. In Bill we trust… oh, am I bothering you? Do your job. Do your job. Do your job. Do your job. Do your job. WAAAH. WAAAAHHH. KISS THE RINGS. This is how the rest of the league sees Patriots fans. Look at it critically. For once in your life Patriots fans. Attacking Bill won’t get you off the list for boat rides in VII Rings. The Celtics missed out on trading two role players to get Paul George. “Oh, but trader Danny shouldn’t let go of Terry Rozier and Marcus Smart. These are role players. The Celtics fans way overvalue every player and pick the team owns, and have even less objectivity than Pats fans. Add to the fact that for some reason the organization is showing tribute videos for Jae Crowder and Jonas Jerebko, and you have one of the least accountable fan bases in the NBA. Listen Celtics fans. The Celtics overachieved this year. But they choked. Game 7 was a choke job. It is okay to have a sour taste in your mouth, don’t hide behind “oh we were hurt.” They had a shot at the finals and they blew it. The Bruins fans are the most cerebral fans out of the bunch. They don’t overreact to every little thing, and they hold their team accountable. They set realistic expectations for their squad, and general manager Don Sweeney and coach Bruce Cassidy set the fans’ attitudes with their calm, blue-collar demeanor which translates to the system the Bruins play with. It’s refreshing to see fans not overreact in the hyper-pressurized environment in Boston, and it paid off this past year. Bruins fans can overreact, however, mostly regarding their two most polarizing players in Tuukka Rask and Zdeno Chara. Bottom line, every Boston fanbase has their pros and cons, but one thing that remains constant is the fact that they are some of the best fans in the country, and their teams don’t disappoint. 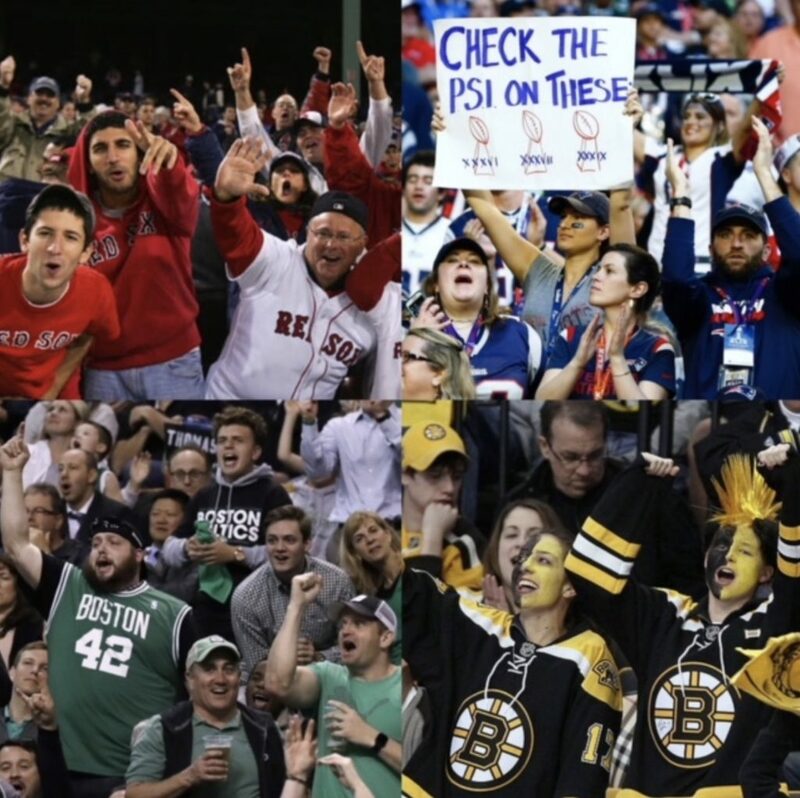 2 comments on "Guerin: Ranking the Fans in the City of Champions"
Great insight into the sports and players of each team Boston Bruins Boston Celtics Boston Red Sox sand Nee England Patriots! We are loyal fans. Arguable that Brady is the best QB ever. If you are going off of super bowls, then maybe. Total stats compared to years played? Peyton has many records and no one can deny Montana and he played when QBs could be hit. Knowing a player can’t really touch you is an advantage QB’s of today have compared to those 20+ years ago. Not taking anything away from Brady, but while he has never had to play for another team, it’s fair to say maybe he wouldn’t have the same success elsewhere. Peyton proved he could win on 2 different teams, and won more MVPs than anyone… ever. That means he was the best player in the league more times than anyone else.